What’s to Learn from This, I’m Wondering? and so on. Meantime, I’ve noticed on the telepathic plane that others’ minds are remembering old powers, and feeling their oats… Fortunately a benevolent Universe won’t let us actually hurt other folks, though we may frighten them, or be frightened by them, as these powers begin to manifest. Video: “Star Trek-Trailer TOS-season 1 episode 1-where no man has gone before,” Wildsauhunter : https://www.youtube.com/watch?v=M3qNW66wvWA .. Gary gains superpowers and uses them unwisely. Video: “Star Trek – Where No Man Has Gone Before,” by CBS: https://www.youtube.com/watch?v=aIFWiSw4M0I ..
Video: “William Shatner Shirtless Star Trek 01 Where No Man Has Gone Before,” by Zainin999: https://www.youtube.com/watch?v=elAhUrxxx94 ..
WHAT’S TO LEARN FROM THIS I’M WONDERING? Well, I would like to remember the Greatness of my True Self, but I don’t want to get into this kind of predicament. Right now I have a couple of aspirations. One is to master my mind, to develop my cosmic mind. For this, I’m asking the Alpha Centaurians for help. I like them a lot — so different from the Hathors, so far beyond what this mental mind of mine knows. I aspire to that wisdom they have so carefully nurtured as a social memory complex (1). Blog: “Ra-En,” by Alice, http://wp.me/p2Rkym-W2 .. In recent experiences with those of Alpha Centauri, I’ve found the thought processes to be so refined, so far beyond me, that I can’t grasp them as words. Apparently they can ‘talk down’ to us though. Gift of an EMF Shield. A couple of days ago, I placed my awareness about a foot above my head, (at the ninth chakra) and asked for an emotional stabilization technique, and was gifted with an electromagnetic field (EMF) shield that they used in the very early days of their racial history to minimize what we call ‘the dark network.’ Those of Alpha Centauri, however, perceive it as unnecessary fluctuations in a being’s EMF. In other words, not as a negative ‘entity’ but as a discrete, stand-alone, energy stabilization issue. 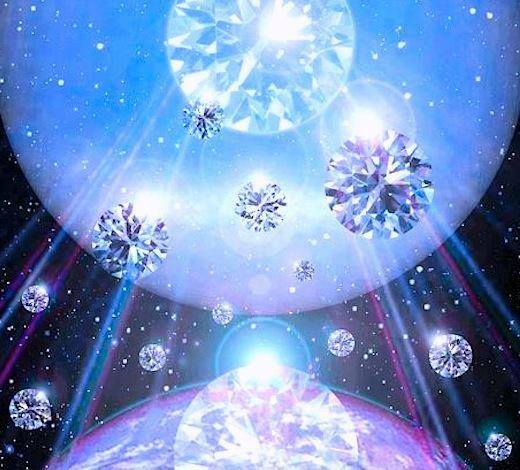 Image: “Diamond LIght”: http://www.starchildglobal.com/assets/Uploads/1513756-10203053225323749-2888700583101062302-n.jpg .. The Alpha Centauri meditation I did felt like this. Celia Fenn (3) calls it the Diamond Light. In human terms, ‘awe’ means a temporary state of emotional body stability caused by unexpected, perceived resonance with another being’s EMF. “Aethos” Meditation by Tom Kenyon. I’d also like to develop the ability to resonate with the song of the Universe, the beautiful song of the Stars. So, believe I’ll take up once again listening to Tom Kenyon’s “Aethos” mp3. (1) For more from Ra (The Law of One) on social memory complexes, see “The Law of One: The Ra Material,” social memory complex search: http://www.lawofone.info/results.php?q=social+memory+complex ..
(2) The word grok is from the book “Stranger in a Strange Land,” by Robert A. Heinlein. See “Stranger in a Strange Land,” in Wikipedia, https://en.wikipedia.org/wiki/Stranger_in_a_Strange_Land ..
(3) See “Starchild Global with Celia Fenn,” http://www.starchildglobal.com/ .. This entry was posted in 06 – Monasic body / Higher mind body (Cosmic mind), 9th chakra, Alpha Centauri, Astrogeophysics - EMF - hologram, Dissolving black magic in the Light, Hathors (see also 'All - Law of One - Ra'), Mastery of mind - subconscious - unconscious mind, Psychic powers, Sirius, Star brothers and sisters - exobiology (see also 'Council of Nine'), Yoga and tagged 9th chakra, Aethos, Alpha Centauri, Alpha Centaurians, Ascension skills, Captain Kirk, cosmic mind, dark network, diamond light, electromagnetic field, emf, emotional stabilization, Hathors (see also 'All - Law of One - Ra'), JScambio, mastery of mind, mind power expansion, ninth chakra, Ra, Siriuns, Sirius, social memory complex, song of the Universe, Star brothers and sisters, Star Trek, subconscious mind, super powers, superpowers, The Law of One, Tom Kenyon on 20 June 2017 by Alice B. Clagett.